WASHINGTON, DC, June 9, 2010 (ENS) – A 1,660 mile mile-long oil pipeline from Canada proposed to run through five U.S. states would be environmentally hazardous and encourage reliance on the dirtiest of fossil fuels, according to a report released today by the National Wildlife Federation. The Keystone XL pipeline would carry heavy bitumen crude from Alberta’s tar sands to U.S. refineries through Montana, South Dakota, Nebraska, Kansas, Oklahoma and Texas to the Gulf of Mexico. The National Wildlife Federation report warns that the proposed pipeline would use “safety shortcuts, substandard materials and unsafe practices that would create a high risk of ruptures that would endanger rare species, water supplies, and rancher livelihoods.” Environmentalists have long argued that tar sands development endangers the climate with high carbon emissions during production, refining and consumption. The U.S. State Department is expected to approve the project over the objections of residents and environmental groups. But there is still time for members of the public to file comments with the State Department. State Department Energy Officer J. Brian Duggan said today the public comment period for the Keystone XL Pipeline Project will be extended to July 2. The State Department will host additional public meetings in Houston, Texas on June 18, and in Washington, DC, on June 29, Duggan said. The Federal Register notice of the extension and public meetings was filed today, and should be published on Monday or Tuesday, he said. 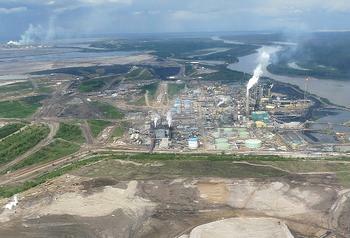 The U.S. government has already approved two dedicated tar sands pipelines. The Canadian company Enbridge’s Alberta Clipper pipeline, running from the U.S.-Canadian border in North Dakota across Minnesota to Wisconsin, has already been completed. 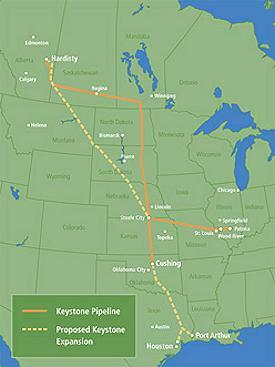 TransCanada’s Keystone I pipeline, which the State Department approved in 2009, runs from Alberta to Illinois and on to Oklahoma. 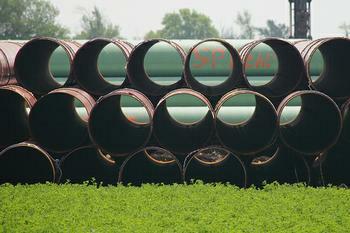 The third is TransCanada’s proposed Keystone XL pipeline, also known as the Keystone Gulf Coast Expansion Project. The 36-inch crude oil pipeline would begin at Hardisty, Alberta and extend southeast through Saskatchewan, Montana, South Dakota and Nebraska. It would incorporate the 298-mile portion of the Keystone Pipeline (Phase II) through Nebraska and Kansas to Cushing, Oklahoma, and build out to a delivery point near existing terminals in Texas on the Gulf of Mexico. The National Wildlife Federation President Larry Schweiger told reporters on a teleconference today that the development of the Alberta tar sands will endanger wildlife, particularly waterfowl and migratory birds, as Canada’s northern boreal forests are lost and rivers are degraded by oil and chemical spills. Dr. Kevin Timoney of Treeline Ecological Research in Alberta studies the effects of tar sands development on wildlife. He told reporters on the call that about one million migratory birds pass directly over the tar sands each spring and fall, coverging from four migratory flyways from the United States. “There is a very large potential for disaster to occur to migratory waterfowl without anyone knowing it,” he said. In the emerging science of “biovector transport of contaminents” Dr. Timoney said migratory birds and fishes become contaminated and transport the contaminants to other areas, leading to the pollution of formerly pristine high Arctic lakes, for instance. “Contamination coming down the Athabasca River is probably going to be much larger than we imagine today,” he warned. There are already more pipelines built to carry oil from the tar sands to the U.S. than are needed for the amount of oil being produced, and building still more will increase costs at the gas pump, says attorney Carrie La Seur, president of Plains Justice, a Great Plains public-interest law center with offices in Iowa, South Dakota and Montana. “If tar sands oil production maintains the same rate of growth it had from 1993 to 2009, it will take almost 26 years to fully use two new pipelines, the Alberta Clipper and Keystone I,” said La Seur. The Department of Energy projects flat U.S. oil consumption through 2030. President Obama’s recently announced increases in car and truck fuel efficiency standards are expected to reduce annual U.S. gasoline demand by nearly twice the capacity of Keystone XL, she pointed out. Marty Cobenais of the Indigenous Environmental Network told reporters that many people on Indian reservations near the proposed pipeline route oppose the project because of the risk of water pollution, and tribal councils have passed resolutions condemning it. If the pipeline breaks, it will spill oil and the chemicals used to dilute the heavy bitumen so it will flow, warned Cobenais. The spectre of water pollution also worries Ben Gotschall, a fourth-generation Nebraska rancher whose land in Holt County lies over the Sand Hill Aquifer. It forms part of the much larger Ogllala Aquifer, which underlies nine states. Both he and Cobenais are concerned about the plan to build rural sections of the pipeline of thinner material than the urban sections. Gotschall points out that the capacity of the proposed pipeline is about 900,000 barrels per day. He challenges TransCanada’s assertion that they could detect a leak of one percent and could contain it to three barrels of oil spilled.